Obviously it has some way to go before it gets anywhere close to being as big as it is in the States though. But to celebrate this annual spending frenzy, here’s a round up of all the Black Friday stats and press releases we’ve received so far this year. And don’t fear, I’m sure we’ll have another one for you next week to show just how crazy everyone went. Online shopping stats from the beginning of November suggest that US retailers are in for a bumper Black Friday. Data from the Custora Ecommerce Pulse shows that online revenue from 1-15 November is up 15.5% compared to the same period last year. Mobile now accounts for more than a fifth (23%) of online sales, up from only 17% in 2013. And Google is the engine powering online shopping, driving 42%% of sales. The data includes more than 100 US retailers, over 100m online shoppers, and over $40bn in ecommerce revenue. Black Friday is old news according to Kenshoo, which found that US shoppers start hunting around long before Thanksgiving meaning that retailers can shift their holiday promotions into swing by 1 November. This day is now handily dubbed ‘Orange Saturday, so we have a new colour-related date to add to our already busy calendar. The data shows that paid search spend began to ramp up nine days before Thanksgiving this year, four days earlier than in previous years. UK shoppers will apparently save £233m over the course of this whole Black Friday/Cyber Monday weekend. This includes savings of £98m on Cyber Monday alone. However they’ll part with around £1.32bn, an increase of 9% on 2013. That’s according to data from Pockit and the Centre for Retail Research. Data from Experian and IMRG suggests that that the key peaks for pre-Christmas online shopping include Cyber Monday (the first Monday in December) and Manic Monday (the second Monday in December). It’s predicted that Manic Monday will see £676.5m in online sales compared to £649.6m on Cyber Monday and £555.5m on Black Friday. According to a survey from Accenture 82% of UK respondents plan to shop on Black Friday and 62% on Cyber Monday. But then 57% had already started or planned to start purchasing presents by mid-September. Nearly all respondents (93%) said that discounts are the primary driver of purchasing decisions related to their holiday shopping. The survey found that clothing (64%), grocery items (49%), gift cards (41%) and toys (37%) top consumers’ Christmas shopping lists this year. Accenture surveyed a representative sample of 500 UK consumers in September 2014. Have you been wondering the best time to tweet on Black Friday to ensure maximum engagement? I know I have, and now this helpful infographic from Socialbro has all the answers. Please be aware that all times are EST and you can click to enlarge the image. We don’t often use infographics here at Econsultancy, but here’s another one for you from the folks at Sq1. 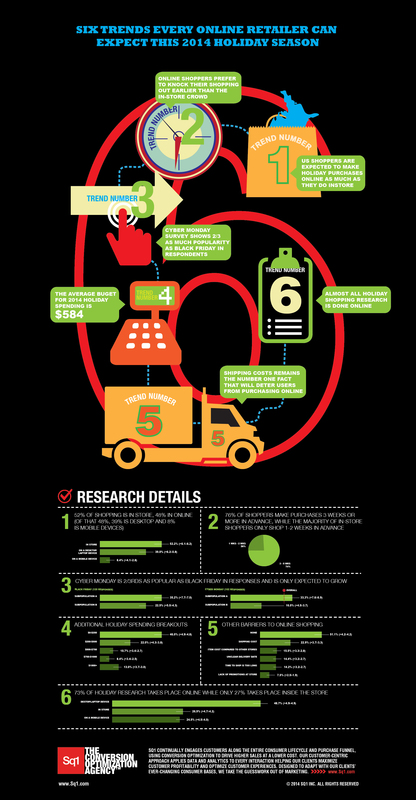 This graphic looks at six trends every online retailer can expect this 2014 holiday season. Again you can click to enlarge the image. Creating and promoting an infographic, it’s a tried-and-tested technique that’s planned for all sorts of reasons. But successfully getting visual content out there, online, can be more complicated than it seems. Just how much of a ranking signal is HTTPS? Since Google announced that it is considering HTTPS protocols as a ranking signal, SEOs have speculated on the real impact of having a secure connection to your page. Our analysis shows that HTTPS could be making a significant impact.